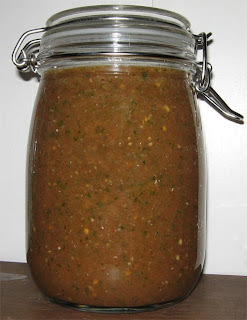 Making good salsa is so easy that it surprises me when I come across bad stuff. The longer I've lived in New England the less surprised I have been on successive occasions, but with that said, there is still no reason to make bad salsa - anywhere! These ingredients can be purchased in most places of the world. A simple recipe like this + a blender = tasty. People like Rick Bayless will rightly tell you that using a blender makes a frothy salsa, but the froth (air bubbles) dissipate after a couple hours, and you want to let your salsa marinate and marry for a few hours before eating it anyway. Combine, blend, enjoy. 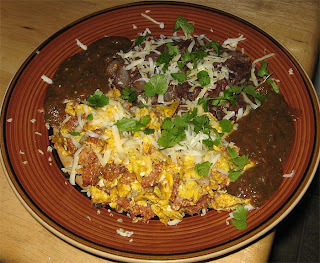 Below is this salsa accompanying huevos rancheros.